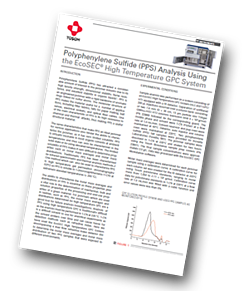 Tosoh Bioscience has produced an application note describing how polyphenylene sulfide (PPS) analysis can be successfully achieved using its EcoSEC high temperature GPC system. 1-chloronaphthanlene (1-CN) at extremely elevated temperatures (> 200 °C). In this application, an EcoSEC high temperature GPC system was used to determine the molar mass averages and molar mass distribution of two PPS samples that were exposed to different environments. Sample analysis was performed on a system consisting of an EcoSEC High Temperature GPC System (HLC-8321 GPC/HT) equipped with an RI detector. Separation of unfiltered 300 μL injections occurred over a column bank consisting of two 7.8 mm ID × 30 cm, 13 μm particle size TSKgel GMHHR-H(S) HT2 columns (exclusion limit 4 × 108 g/mol)(PN 22889) followed by the corresponding guard. More details can be found in the application note. 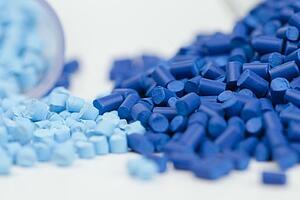 The new and used PPS materials were shown to have significant differences when analysed by GPC/RI. The polystyrene relative molar mass averages, molar mass distributions and GPC elution profiles of the new and used materials were compared to determine if usage of the PPS sample played a role in the failure of the product. The new PPS sample was determined to have a higher molar mass, broader molar mass distribution and a larger polymeric size than the used PPS sample. Using the PPS sample for a predetermined amount of time appears to decrease the molar mass averages and polymeric size of the polymer. The use of GPC/RI for the failure investigation of PPS allowed for immediate differentiation between the new and used PPS samples based on the GPC/RI elution profile, which was then confirmed through differences in the polystyrene relative molar mass averages and molar mass distributions. The dual flow refractive index design of the EcoSEC HighTemperature GPC System permitted the analysis of PPS in a traditionally difficult solvent system for GPC analysis, 1-CN at 220 °C.